Split the crayfish evenly down the middle. Place skin down onto a hot plate quickly to half cook the crayfish meat. This makes it easier to remove from the shell. Remove the meat from tail sections, and dice in to bite size pieces. Sauté crayfish pieces in a little butter in a pan for approx. 2 minutes until cooked. Melt butter in saucepan and stir in flour. Slowly add the milk, stirring all the time over heat making sure it does not become lumpy, until you obtain a smooth sauce. Sprinkle in the curry. 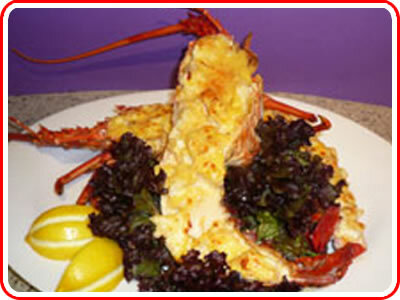 Add ½ cooked crayfish pieces and stir through sauce. Spoon Crayfish and sauce into scallop shells. Sprinkle freshly chopped parsley into the sauce. Now place under grill for 3-5 minutes to glaze.